An expanded second edition of Andrew Scott’s The Promise of Paradise: Utopian Communities in British Columbia, was published by Harbour in March 2017. 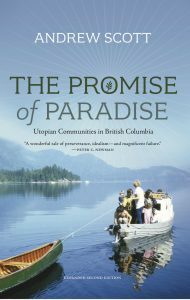 The Promise of Paradise explores the successes and failures of the many idealistic intentional communities that have appeared across British Columbia over the past 150 years, from the “model” Christian villages of the missionaries, through the Doukhobors, the Brother XII cult and the counterculture communes, to today’s sophisticated co-housing projects. Many communities discovered hardship, disillusionment and failure, but new groups sprang up—and continue to spring up—to take their place. Marvel at the stamina and courage of the early Scandinavian settlers, who created utopian colonies at Bella Coola, Cape Scott and Sointula. Encounter the Emissaries of Divine Light, who went forth from their base at 100 Mile House to build hotels, own a jet and establish branches around the world. Relive the 1970s, when the Sunshine Coast’s many communes set off a storm of hostility from locals. Meet the Ochiltree Organic Commune, which rebelled against hippie standards to embrace meat-eating and coffee-drinking. With careful research and engaging first-person accounts, the author sifts through the wreckage of the utopia-seekers’ dreams to lay bare the practices and philosophies of today’s intentional communities. This book is a compendium of astounding misadventures as well as an intriguing analysis of what moves people to search for paradise. Click here to visit the Harbour Publishing website.